More than 400 troops defected from the Yemeni military Saturday evening, saying they would no longer attack unarmed protesters. The troops announced their defection after standing for hours in front of tens of thousands of anti-government protesters in Sanaa and vowing to support their cause with their lives. "We will stand with the will of the people and will not kill unarmed youth. We are here to defend the people and we will do that," one soldier told CNN. "The butcher must stand trial," the troops shouted as they marched in what has been known as Change Square Sanaa. The organizing committee in the square announced this week that dozens of unarmed youth activists were killed by government forces over the past month. The committee says nearly 1,000 youths have been killed by the government since protests began in January. 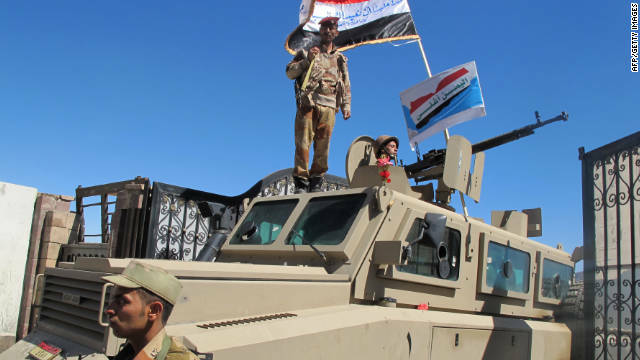 Hours after the celebration, the defecting troops were welcomed at the military compound of Gen. Mohsen Ahmar, who defected from the government forces in March. The majority of the troops were members of the Republican Guards and central security forces, which are headed by President Ali Abdullah Saleh's eldest son and nephew. D-FOX: Please contact us if you can read this. Is Ron Paul the only one that wants peace? The Great Swindle of 2000: The Swindle Continues! Will governments soon read minds? Why is the US giving aid to China? Nuke rumble: "Press the Persians, or else"